So I bought a Rhodes 73 with suitcase amp, unfortunately the preamp didn't work so I've had to do some research. 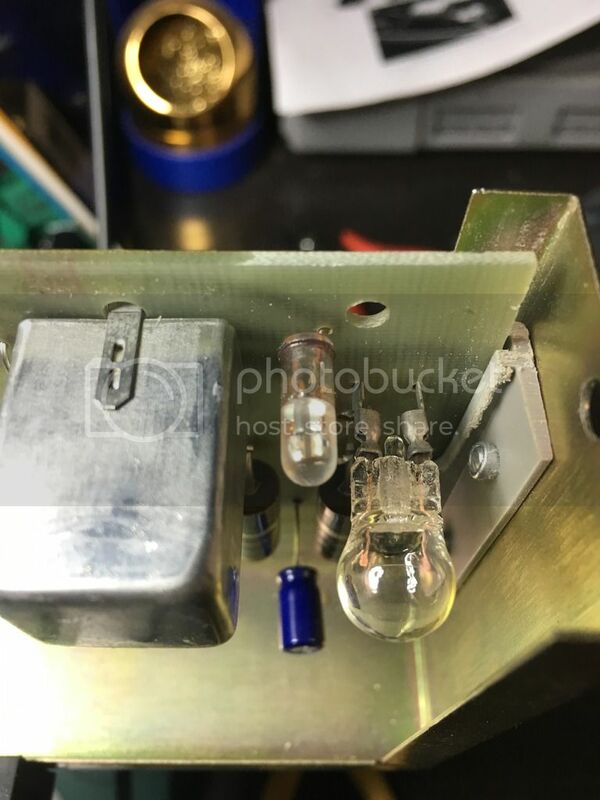 I found a post here on the forum stating to check the bulbs. I ended up replacing one of the bulbs that didn't work, but it didn't solve the issue, still no output. But when I try to turn the vibrato circuit on, I don't get an alternating pattern between the two bulbs, just the bulb I replaced being closest to the end of the board goes out, and the one next to it stays solid and that's it until I disengage the circuit. I purchased a repair kit from Vintage Vibe but before I go about that, I wanted to see if anyone had any ideas as well as if they thought that the repair kit will or should remedy the issue I'm having. Additionally, if I do go about that repair, is it as simple as just going off this picture? One last thing, before anyone assumes it's the amp, I have another identical working rhodes, so I've been testing the preamp on it and haven't been getting any output on it neither. Re: Help with 4 Pin Preamp! The capacitor replacement might fix your problem, and it certainly won't hurt. Yes, it really is pretty simple. Get a solder sucker (like https://www.amazon.com/Teenitor-Solder-Sucker-Desoldering-Removal/dp/B0739LXQ6N/ref=sr_1_10?s=hi&ie=UTF8&qid=1513196076&sr=1-10&keywords=solder+sucker) or similar. The solder sucker makes the work faster and less messy. I personally liked using solder braid years ago, but I have not had great luck with cheap modern versions of solder-removal braid. Get the three pack of solder suckers, because they are remarkably low quality (disposable). The tips get damaged from the heat, so it isn't that hard to ruin one. It is more likely that you have a bad solder connection or broken wire than a component failure (excluding capacitors). But it is possible that one of the transistors is bad. Thanks for the response, I ended up going forward and replaced all the capacitors, took me about an hour and a half for the whole process. Unfortunately I'm left with transistors and stuff but have no idea where to replace them as I didn't understand the schematics so well. Also, what is the clear tube next to the bulb, do these go bad? That's a light dependent resistor, when the bulb illuminates the LDR then allows the audio signal to travel through that channel. Those rarely go wrong. Could be one of the vibrato transistors has gone. You may want to look up a basic explanation of transistors online, how to test them with a multimeter etc. or take it to any electronics repair shop with the schematic and ask them to replace the transistors. I watched a documentary a few months ago about the origins of transistors and it's pretty remarkable. As Ben said, it's like an electronic switch. It's a 3 layer sandwich with the filling made of a semi-conductor (an material which can conduct electricity and also prevent it depending on it's state originally these were Germanium but then they switched to Silicone.) When a small charge is applied to the semiconductor material (the middle) it acts like a open gate and allows the current to go from one side to the other. When the charge is removed the gate closes. I found this image which pictures it pretty well. I would go with Ben's suggestion and get an electronics repair shop to do the work. The trace can be easily lifted on Peterson preamps. The transistors, resistors, and diodes supplied in your kit are intended as replacements in case you find a failed component on your preamp. The transistors supplied as shown in your photo are meant to replace a failed 2N3392 transistor. There are ten of these on your preamp. These transistors are available at Mouser for 58 cents each. It is a low-voltage small-signal NPN silicon transistor in a TO-92 case. There are lots of transistors that would work in this preamp as a replacement for the 2N3392. For instance, I have a lot of BC337-25 transistors on hand, and I bet they would work just great. BC337-25 has higher working voltage, higher max collector current, and similar hFE. But the BC337-25 transistor is arranged in the TO-92 case with a different pinout order. Vintage Vibe has supplied you with a transistor that also has a pinout arrangement that is not the same as the 2N3392 original. This isn't a huge problem, because the Rhodes folks arranged the PC board layout before the advent of machine-stuffing production lines. So the board layout has the emitter, base, and collector solder pads arranged in a triangle (instead of straight-in-a-line). So all you have to do is carefully get the emitter, base, and collector inserted in the correct holes. The flat side on the transistor may be facing a different direction, but who cares? The pinout of the original 2N3392 transistor is Emitter, Collector, Base (E-C-B) from left to right. Vintage Vibe claims that the replacement transistor is Emitter, Base, Collector (E-B-C) from left to right. Can you read the markings on the transistor that Vintage Vibe sent you? Maybe they substituted a 2N3904, which would have the Emitter, Base, Collector (E-B-C) from left to right. In any case, to fix your preamp, you need to determine which component is problematic. In your case, since you had a fried lamp I would focus on components that could cause the lamp to blow, and components that would cause the tremolo oscillator to stop. So maybe one of the diodes or one of the two 2N3053 transistors died. The 2N3053 transistors are the larger ones in the TO-39 metal can. These cost $2.31 each at Mouser. However, even if only one lamp is dead, and the oscillator is stopped, you should get audio out (as long as the other lamp is lit). This indicates that one of the 2N3392 transistors in the audio path is probably fried. You should go ahead and install the replacement 150Ω resistors without even bothering to check the old ones. It is an easy swap. But to find the real culprit, you need to get some trained diagnostic eyeballs, meter, and oscilloscope on that preamp. Thanks for the help so far everyone! I've replaced the resistors, so all I'm left with now diodes and the transistors. Unfortunately I when I originally replaced the caps I misread the diagram and accidentally installed two 100uf Capacitors next to each other instead of one 10 and one 100 so I'm now missing a 100 on the left portion of the board since the legs were cut too short. If any one has a spare 100uf cap laying around I'd be happy to pay for postage and what not as postage from mauser just for a single item is $5-7, so I'd be happy if someone could throw one in an envelope with a stamp. Furthermore, I emailed vintage vibe and one of the fellows there was nice enough to email me another diagram which he personally updated for me on the resistors and transistors. Now in regards to the transistors, just to verify, with the flat part of it facing you, and the pins down, transistors are typically from left to right, E-C-B in that order? as for the ones from vintage vibe are E-B-C so as long as I get transistor facing the same orientation (flat and rounded side) as the old ones and the last two legs (C & B) directed into the holes like the above picture I'll be alright? Take the 100uF capacitor that you mis-installed and had to remove, and solder little leg extensions onto it. Just wrap little pieces of wire around the terminals, so that they are long enough to reach the holes in the circuit board. Solder it all together, and you are in business. Sean, not sure where you got the $2.39 price tag from but the 2N3053 that I found from mouser are $6 a piece. Additionally, I decided to replace the two transistors that were marked on the picture, and did another 2 else where on the board. 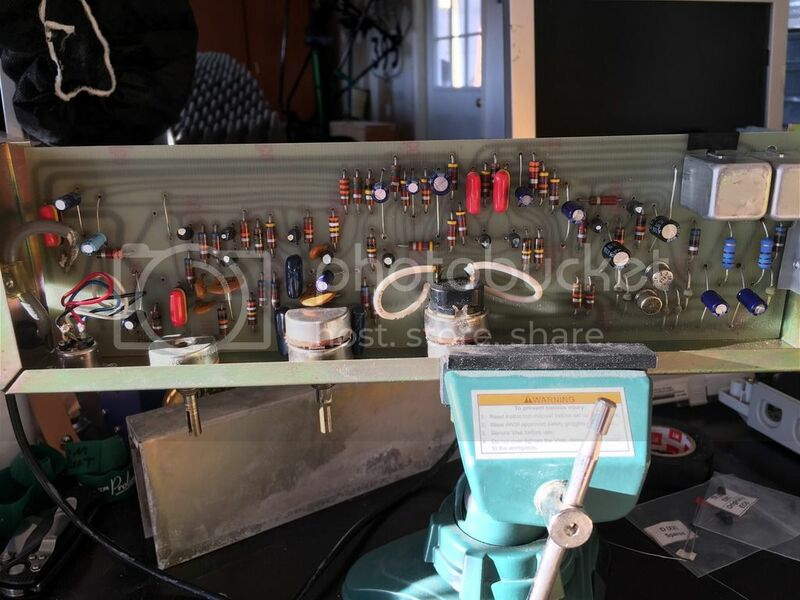 I might end up just replacing all of the original transistors just to be sure as I have no way of really testing or checking anything let alone the knowledge of how to test them as the only thing I have is a harbor freight multimeter. Only problem was one of the one transistors I removed was a little difficult as it had a disc capacitor that it shared the holes with so that ended up getting damaged on removal. From What I can read it says 1kv 330k z5p. Lastly, I'm just going to purchase the remaining transistors from mouser as well and this seems to be the only one available, will this do? 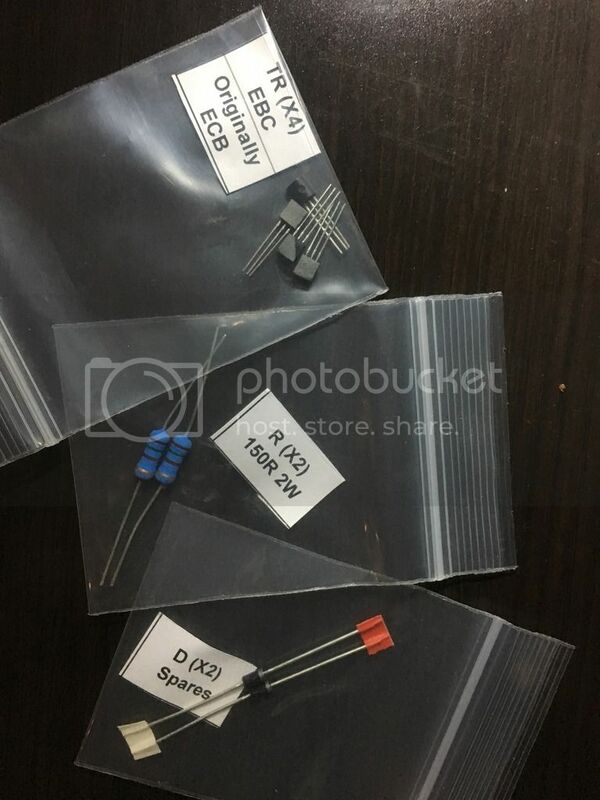 I checked the datasheet and it looks like these are exactly like the originals in the sense that the order of the pins are E-C-B from left to right in comparison to the E-B-C ones vintage vibe supplied me with. Am I correct in thinking this? So I could install these the exact same way. PS. I want to use the 2 spare diodes I was supplied with in order of increasing my chances of fixing this, which 2 of the diodes would be the most logical to replace that are in the audio path that might cause me not to get any sound? The 2N3053 is $2.31 on Mouser today. The 2N3053A is the more expensive one. Dunno how your search didn't find the cheap one. Yes, I think that 330pF ceramic disk capacitor from Murata will be fine. And yes, if you get the 2N3392 transistor in the TO-92 plastic package, it will have the same pinout that it has had for 40+ years: E-C-B. None of the diodes are in the audio path, they are in the tremolo oscillator and lamp circuit. Since the schematic says they are "2A diodes", I would buy a few dozen 1N5408 diodes. They are physically the same size as the 1N5401 diodes, but rated to survive much higher reverse voltage. They cost exactly the same as the 1N5401 diodes (unless you buy hundreds of them). The 1N5408 diodes are rated for 3A of current (more than ten times what is needed here). The leftover diodes will come in handy some day. That's sort of irritating then, I don't understand why Vintage Vibe would even ship E-B-C instead of keeping it simple and ship E-C-B transistors ahhh, I thought I had read something about the some diodes in the audio path but I got mixed up with the transistors. I suppose I'll just leave the original diodes be for now then. I just ordered everything, but I have one last question which I hope to be my last question if all of this solves my issue. The ceramic disk capacitor is there a negative or positive legs? I looked at the old one, and the datasheet for the new one but there's no markings or anything stating polarity. The ceramic capacitors don't care about circuit polarity, they are constructed symmetrically. You can't install them wrong. well good news and bad news. The preamp seems to be working, the vibrato circuit is fixed and both bulbs are now alternating back and forth when activated and vary in speed when I change the pot value, but unfortunately I'm not getting any sound still. Oddly enough, I do hear a low pulsating noise on my speakers from the vibrato circuit when it's activated as well as scratching from twisting the volume knob back and forth which is telling me the preamp is communicating fine with my speaker cabinet. So at this point it seems the culprit might be the rca cable that plugs into the rhodes rca pickup output jack. I assume it is this and know it is not the rhodes itself because it outputs sound from the pickups just fine when I use my other preamp. Additionally I have tried use the accessory return jack to plug in an ipod and no sound passes through it either. So it looks like the accessory jacks and rca wire are going to be replaced. If you have the preamp out of its case, try touching with your finger the spot at which the input from the harp connects to the preamp. If you hear no hum, your problem is likely to still be in the preamp. To be sure, you could unsolder the input wire so that there is no signal connected to the preamp's input. Then, once again touch your finger to the input. If there is still no hum, then your probably is almost surely with the preamp. Well unfortunately what I thought was the RCA cable isn't, I replaced the old with the new and still no sound. So now it's back to the preamp. I'm honesty not sure what else it could be as I've replaced so many of the components already. Please post a fresh photo of the top side and bottom side of your board. Have you checked for sure that the volume, bass, and treble potentiometers are functioning correctly? No open circuits there? No short circuits there? Stop and triple check that every transistor is installed correctly. Follow the traces on the board to verify that they connect to nearby components as shown in the schematic. Then spend a little time probing around the board to verify that voltages are reasonable at each transistor. Since they are all NPN transistors, you should get the voltage at the base terminal to be slightly higher than what is measured at the emitter. Vbe should be around .5V to .7V in a happily-biased small-signal transistor. You know that the oscillator section is working, because the lamps are working. So no need to poke around there. It is time to trace the audio through the board step by step. An oscilloscope is easiest, but you can build a little probe to feed audio into your guitar amp, or keyboard amp. Thanks Sean, I ended up getting the preamp working one of the caps was reversed. Piano plays beautifully now but unfortunately only one of the four speakers in the cab is working. Is this a common issue? could the speakers have gone bad or could it just be a wiring issue? I haven't had a chance to open up the cab but what the cones look good from what I can see through the grilles. Additionally the sustain pedal is currently working either. Are those easy to fix?